Recommended to: Readers who enjoy witty and strong female protagonists who get themselves into all kinds of adventures! June Jenson, an accomplished Oxford professor, has spent her life trying to get out from under the shadow of her infamous grandfather: a renowned archaeologist accused of stealing a relic during an excavation at Sutton-Hoo. When a secret alliance recruits June to guard priceless artifacts she realizes that this is her chance to contribute to the history she loves and rid herself of the cloud of suspicion that her family has lived under for so long. But, when the artifact June is commissioned to guard turns out to be the same relic her grandfather was accused of stealing− a relic he has consistently claimed never existed − her carefully laid plans of family redemption are a bit shot. 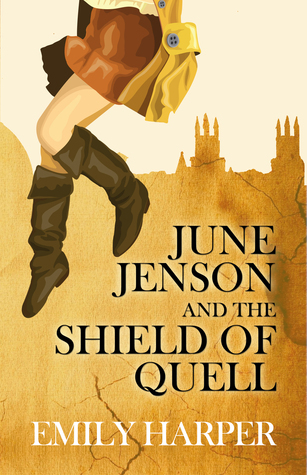 Now, with the aid of her accused grandfather who suffers from early onset Alzheimer’s, and a chauffeur who’s looking for a scandal to make him famous, June must race to discover the truth of the shield and what really happened at Sutton-Hoo all those years ago. Well now, this was a lot of fun! I already knew that June and I would get along famously. After all, she's an accomplished Oxford professor, loves her grumpy old grandfather, and simply wants to make a name for herself in the world of archaeology. What's not to love? My only hope was that her journey would be just as exciting as she was shaping up to be. Happily, that was exactly the case! Massive love goes to Emily Harper for crafting such enjoyable characters. Although I already knew I'd love June, it was really her grandfather that stole my heart. His giggle worthy attempts at complimenting June, his deep dislike of trousers (I feel you on that, Professor), and his need to keep his accomplishments in the forefront of his mind, were all things that endeared him to me. Pairing him with June, who just didn't know how to handle him at all times, was perfection. I loved watching them interact, and thought he added a perfect spice to the mystery! Now, the mystery itself, shall we? I thought Harper did a brilliant job at laying out all the breadcrumbs as June fell further down the rabbit hole. From the moment she was inducted into the secret "Alliance" guarding the shield, I knew that things were going to get interesting. What I didn't expect was how much fun this whole mystery would be. As June and her rather unusual entourage searched for answers, I breathlessly followed after them. There was the perfect amount of humor, mixed in with all the action. As I said, a ton of fun. Am I ready for the next book? Absolutely, I am! Which, thankfully, I also have in my possession. Expect to see a review of that book as well, very soon. 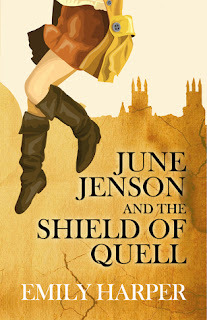 While you wait, pick up June Jenson and the Shield of Quell! It's well worth your time!